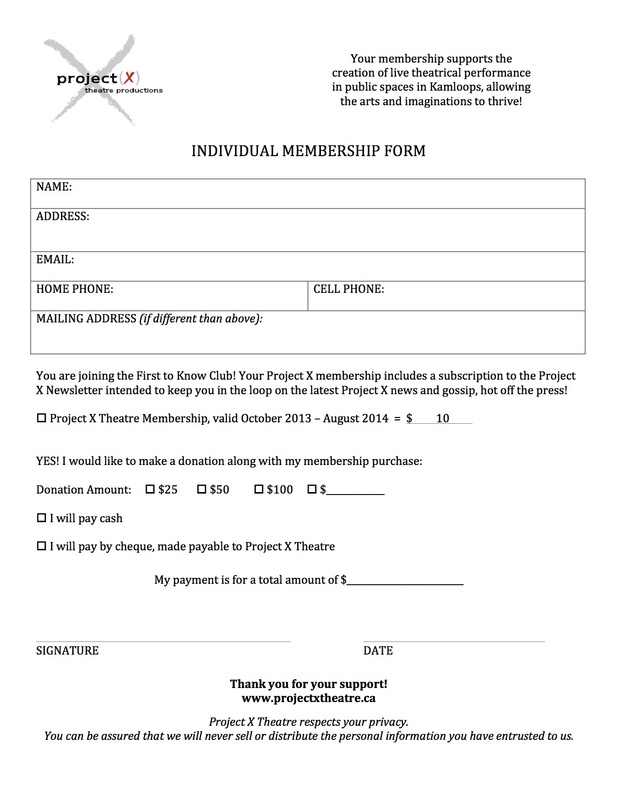 There are many ways you can be a part of Project X Theatre and support the creation of live performing arts in Kamloops! Every dollar counts for a non-profit organization like Project X. Large or small, your contributions have a big impact, allowing us to keep producing high quality theatre for your enjoyment while keeping our ticket prices accessible to more people in our community. Each year, XFest brings bold and creative live professional theatre to over 2500 young people and their families. Being a sponsor is a great way to support local arts and culture while promoting your business. A healthy membership not only contributes to our fundraising efforts but it also demonstrates to our funders and sponsors how valued and supported we are by the community. Members are automatically in the first-to-know club when it come to hot of the press Project X news and we are currently working on developing some special perks that will come with membership! Membership is $10 and renewable annually. Do you love being a hands on participant? We can always use dedicated volunteers - no special skills required but if you do have a specialty then let us know. Volunteers helps us with everything from ushering and taking tickets at the shows to building and painting sets. Not only will you be helping Project X, we promise you will also have a blast doing it! If you'd like to help out then send us an email today! A huge THANK YOU to our amazing donors and supporters!